WordPress for iOS version 11.9 beta is available for testing on TestFlight. Not part of the beta program yet? Please sign up for our TestFlight program (open the link on your iPhone or iPad) to join as a beta tester. Block Editor: The block editor for the apps is now in beta! Check out the block editor announcement post for details about what to expect and how to test it. Find all other changes/fixes in the related PRs targeting 11.9. WordPress for Android version 11.9-rc-1 is available for testing on the Beta channel. Find all other changes/fixes and details in the related PRs targeting 11.9. I’m proud to announce that we’ll be shipping the first public version of the block editor in the apps with their 11.9 release. This release will be available for beta testers today (learn more about testing the apps), and the general public in March 11th. For this first version, our main focus was to build a pleasant writing experience with support for the most basic types of content. Our data showed that 90%+ of the posts created on the mobile apps consisted of basic text and images, so we decided to focus on supporting the Paragraph, Image, and Heading blocks on this version. On iOS, using typing suggestions sometimes removes spaces between words. On iOS, dictation doesn’t work at the moment. On Android, when you insert a Heading block it initially shows no formatting. 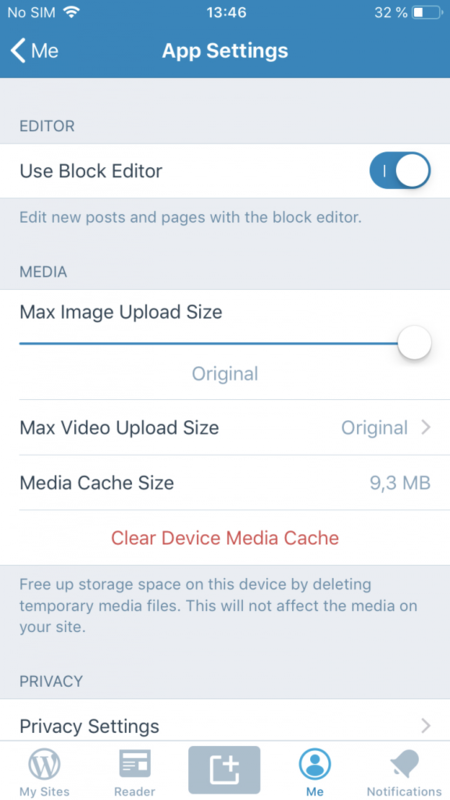 Once you have version 11.9 of the apps, the block editor will be available, but not always used by default. When you edit an existing post, it will detect if it has block content and open it in the block editor, otherwise it will open in the classic editor. 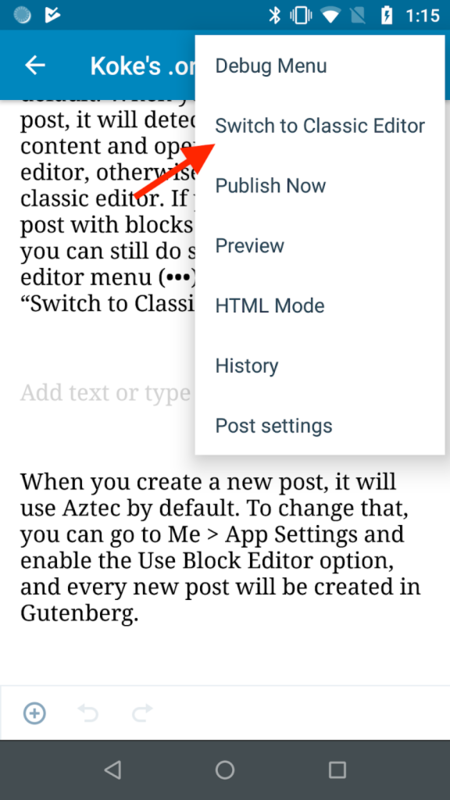 If you prefer to edit a post with blocks in the classic editor you can still do so by going to the editor menu (•••) and choosing “Switch to Classic Editor”. When you create a new post, it will use the classic editor by default. 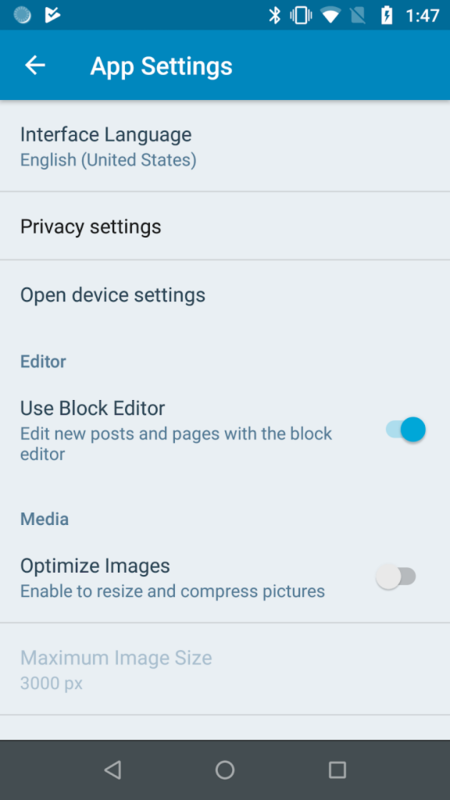 To change that, you can go to Me > App Settings and enable the Use Block Editor option, and every new post will be created in the block editor. After the release, we will start working on some UX improvements and visual refinements that didn’t make it in time, and any major bugs that comes up. Shortly after that we’ll also spend time adding support for the most common blocks and use cases. You can follow along on the Gutenberg and gutenberg-mobile Github repos, and if you have any questions or want to get involved, you can discuss here or find us in the #core-editor and #mobile rooms in WordPress.org Slack. WordPress for Android version 11.8-rc-1 is available for testing on the Beta channel. In Stats, a date selector to move to the next/previous time period has been added. Unused location permissions have been removed. Quick Start experience (for new signups in the app) has been improved. Small visual tweaks in the Stats pages. Find all other changes/fixes and details in the related PRs targeting 11.8. WordPress for iOS version 11.7 beta is available for testing on TestFlight. Added support for password autofill when entering a username during login. We now automatically save your draft before showing you a preview of it. Fixed an issue causing big spaces on top of (or below) some images in reader. Fixed a visual bug causing the posts list not to look right at large text sizes. Find all other changes/fixes in the related PRs targeting 11.7. WordPress for iOS version 11.6 beta is available for testing on TestFlight. Change your password in the app! In this release, we’ve added the ability to change your password from within the app, polished the UI across the entire app, and squashed a huge pile of bugs! We’ve also reduced the CPU and battery usage of the app in an effort to be better citizens of your device. A little extra polish never hurt. It’s easier to adjust settings when creating a site – you can start over from the topic screen, and the visual consistency is smoother. We upped the minimum heights and spacing between elements on some fields and screens to make writing more comfortable. And if you’re logging into an account that has no sites, you won’t see an unnecessary screen listing your sites (or, y’know, not listing them). When commenting in the Reader, post titles display correctly. Sites viewed at larger text sizes display their URL properly, and long labels in app settings aren’t cut off — text sizing across the app is better in general. Oh, and sometimes you’d open a post revision into the editor, and the keyboard would hide the notification; now it doesn’t. Pointless error messages are pointless. If there’s a problem setting a password when signing up for a new account, you’ll get a helpful error message; ditto if a comment you write doesn’t post correctly. And searches without results have complete error messages. More localization means a better app in any language. The Terms of Service are properly localized, because we should all know what we’re agreeing to. Buttons for sharing content to WordPress from another app are properly translated, and so is the button to edit a comment from your Notifications. 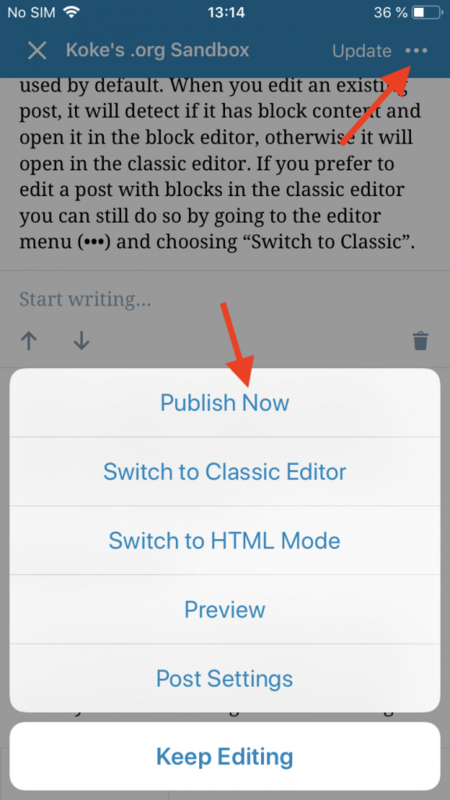 The “Done” button after publishing a post is also translated (and physically easier to tap!). Unlike real bugs, tech bugs serve no purpose. You can delete a user now, and they won’t appear in the list any more. The Stats widget will stop reverting back to the primary site, and the wrong images won’t appear in the notifications list any more. I your site is private, visual mode for revisions works correctly for posts that include images. No one likes to crash. Images failing to upload properly, media reloading in the background, and navigating away from a table view while it had a progress bar on it no longer lead to crashes. Huzzah.